Welcome to the forum!! That is a beautiful little pond you have! I know how sad you get when winter comes because I have to do the same for my pond. I have a large net we pull over to keep out the deciduous leaves. I don't even think I have a pine tree in my yard! I can't wait to see some more of those lilies in the spring! I've never had sucess with them because my pond is too shaded. awwww…see you again in the spring..
Aww that stinks, but at least you get to enjoy some blooms earlier in the year. I'm hoping I can coax some blooms in spring this year. 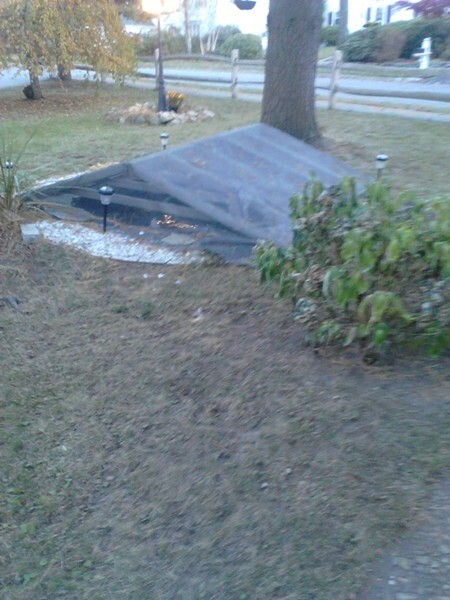 I really like that cover you put over your pond!! Slanted so the leaves fall off. Mine is just a PVC frame to prevent the net from falling in the water. I have to go out there every week or so and sweep off the pond. You can walk on it?! Man, you did build that pretty strong. One of the reasons I clean mine so obsessively is so the deer don't walk on it. But with 3 feet of snow, I can understand why it would need to be that strong. Oooooh so pretty Thanks for sharing your pond pics and story. I'm looking forward to pics. of grandpa Louie in the spring. And do I detect an Animal House reference there about his eating habits? LOL. why not quote a clasic movie..